Today we did a bicycle ride of 20+ miles checking out a new section of bike trail. The new section, we thought, went into downtown Cleveland. It doesn’t and we somehow managed to get off course. Portions of the trail follow the course of the Ohio & Erie Canal and the Cuyahoga River, all greener and more beautiful than one might expect. The big surprise of the day? We spotted a Bald Eagle perched atop the bare upper branches of a tree near the river! The trail emerges into neighborhoods and industrial areas where, in one case, we scaled a challenging hill on a road that was all bad news. 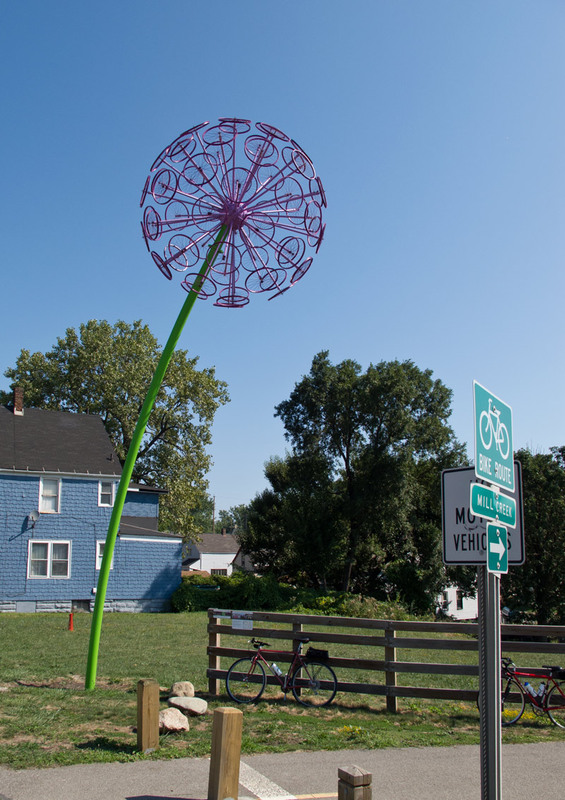 We did survive, however, and made it to the northern end of the line –an eastern neighborhood area of Cleveland– where we discovered the large, whimsical sculptural piece we’d hoped to see. 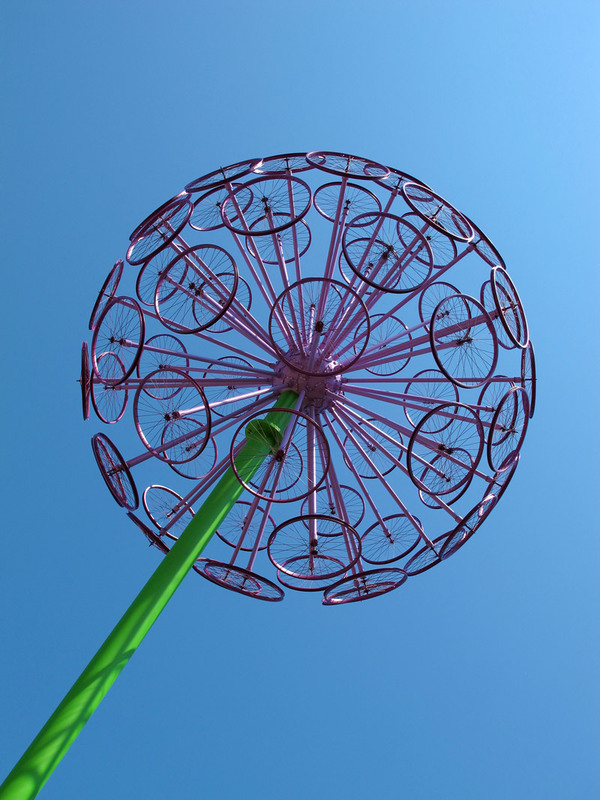 The piece, “rotaflora” by Jake Beckman, is in the form of a flowering garlic plant and the flower head is made from bicycle wheels! Dinner at home tonight: vegan “ribs” with barbecue sauce (actually quite good), homemade sweet potato fries, and veggies, served with a nice pinon noir. Yum. I've just poured myself a High Note (Argentina) Malbec – very nice even if I'm going to have it with a Greek Salad…… That's a cool sculpture – how high is it?